Radiologists have been identifying foreign objects ingested by children since the beginning of clinical X-ray imaging, but pieces of a new toy — the fidget spinner — were added to the repertoire in 2017. The experiences of radiologists at Texas Children’s Hospital in Houston are described in the June 28 online issue of Pediatric Radiology. The toy is marketed as an aid to increase attention span, which could benefit children with attention deficit hyperactivity disorder (ADHD) who have sensory and/or attention special needs. Because fidget spinners are marketed to older children, this toy does not fall within stringent construction requirements required by consumer protection laws for toys marketed to young children, according to the authors. As a result, they may be easier to dismantle and to break. Over 1,000 children were treated at the hospital between March 2017 through February 2018 for accidental foreign body ingestions, 10 cases of which involved fidget spinner components. Lead author Marla B. K. Sammer, MD, a pediatric radiologist, and colleagues conducted a study to identify the toy parts and number of incidences of fidget spinner ingestions, and also to determine the age of these patients and whether they had ADHD. The study included a comparison with a nested cohort of 343 non-fidget spinner ingestions over four months for rates of mean age, use of ADHD medication, and endoscopic intervention. X-rays revealed pieces of eight fidget spinners in the esophagus, stomach, and colon in eight of 10 cases. The 10 children ranged in age from 2 to 10, with a mean age of 7 years. Two were taking ADHD medication. The ingested components included three button batteries, three ball bearings, a ball, two plastic discs, a washer, and a broken aluminum wing. They ranged in diameter from 9 mm to 29 mm. The components had been swallowed either after the toys broke or had been disassembled during play. 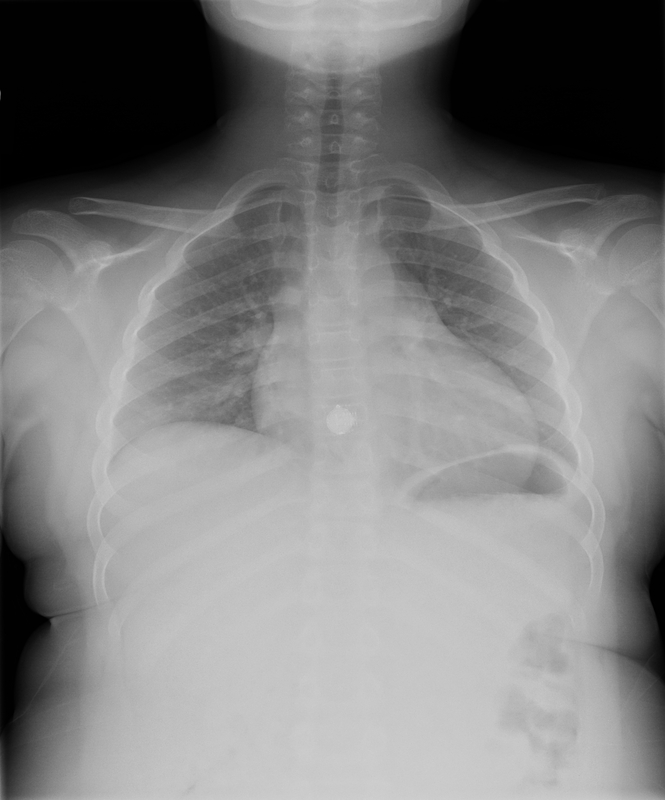 Frontal chest radiograph localizes a button battery to the esophagus which was subsequently endoscopically removed. The 9-year-old boy was playing with a fidget spinner when it broke and he accidentally swallowed a piece of the toy. 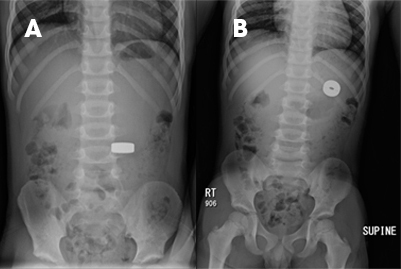 Frontal upright (A) and supine (B) abdominal radiographs identify a metallic ball bearing from a broken fidget spinner in the stomach. The 4-year-old boy reported he had accidentally swallowed part of a fidget spinner. The component was endoscopically removed 11 days after ingestion due to continued abdominal pain. Buerkle AM (2017) Statement from acting chairman Ann Marie Buerkle regarding fidget spinners. United States Consumer Product Safety Commission. www.cpsc.gov/about-cpsc/chairman/ann-marie-buerkle/statements/statements-from-acting-chairman-ann-marie-buerkle-1. Fidget Spinner Business Guidance. United States Consumer Product Safety Commission. https://www.cpsc.gov/Business-Manufacturing/Business-Education/Business-Guidance/Fidget-Spinners. Sammer MBK, Kan JH, Sammer MD, et al. Radiographic appearance and clinical significance of fidget spinner ingestions. Pediatr Radiol. Published online June 28, 2018. doi.org/10.1007/s00247-018-4179-8. What radiologists should know about ingested fidget spinner parts. Appl Radiol.